^ a b Marek Sobczyński. "Procesy integracyjne i dezintegracyjne na ziemiach litewskich w toku dziejów" [The process of integration and disintegration in the territories of Lithuania in the course of events] (PDF) (in Polish). Zakład Geografii Politycznej Uniwersytetu Łódzkiego. Archived from the original (PDF) on 4 March 2016. Retrieved 22 February 2016. ^ a b c d Wiemer, Björn (2003). "Dialect and language contacts on the territory of the Grand Duchy from the 15th century until 1939". In Kurt Braunmüller; Gisella Ferraresi (eds.). Aspects of Multilingualism in European Language History. John Benjamins Publishing. pp. 109–114. ISBN 90-272-1922-2. Retrieved 19 July 2016. ^ Wiemer, Björn (2003). "Dialect and language contacts on the territory of the Grand Duchy from the 15th century until 1939". In Kurt Braunmüller; Gisella Ferraresi (eds.). Aspects of Multilingualism in European Language History. John Benjamins Publishing. pp. 109, 125. ISBN 90-272-1922-2. Retrieved 12 August 2016. The history of Lithuania dates back to settlements founded many thousands of years ago, but the first written record of the name for the country dates back to 1009 AD. 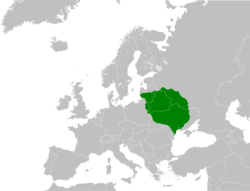 Lithuanians, one of the Baltic peoples, later conquered neighboring lands and established the Grand Duchy of Lithuania in the 13th century. The Grand Duchy was a successful and lasting warrior state. It remained fiercely independent and was one of the last areas of Europe to adopt Christianity. A formidable power, it became the largest state in Europe in the 15th century through the conquest of large groups of East Slavs who resided in Ruthenia. In 1385, the Grand Duchy formed a dynastic union with Poland through the Union of Krewo. Later, the Union of Lublin (1569) created the Polish–Lithuanian Commonwealth that lasted until 1795, when the last of the Partitions of Poland erased both Lithuania and Poland from the political map. Afterward, the Lithuanians lived under the rule of the Russian Empire until the 20th century. Jogaila, later Władysław II Jagiełło was the Grand Duke of Lithuania (1377–1434) and then the King of Poland (1386–1434), first alongside his wife Jadwiga until 1399, and then sole King of Poland. He ruled in Lithuania from 1377. Born a pagan, in 1386 he converted to Catholicism and was baptized as Władysław in Kraków, married the young Queen Jadwiga, and was crowned King of Poland as Władysław II Jagiełło. 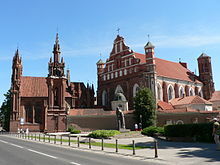 In 1387 he converted Lithuania to Christianity. His own reign in Poland started in 1399, upon the death of Queen Jadwiga, and lasted a further thirty-five years and laid the foundation for the centuries-long Polish–Lithuanian union. He was a member of the Jagiellonian dynasty in Poland that bears his name and was previously also known as the Gediminid dynasty in the Grand Duchy of Lithuania. The dynasty ruled both states until 1572, and became one of the most influential dynasties in late medieval and early modern Central and Eastern Europe. During his reign, the Polish-Lithuanian state was the largest state in the Christian world. The Lithuanian nobility was historically a legally privileged class in the Grand Duchy of Lithuania consisting of Lithuanians, from the historical regions of Lithuania Proper and Samogitia, and, following Lithuania's eastern expansion, many Ruthenian noble families (boyars). Families were primarily granted privileges for their military service to the Grand Duchy. The Polish-Lithuanian Commonwealth had one of the largest percentages of nobility in Europe, close to 10% of the population, in some regions, like Samogitia, it was closer to 12%. Vytautas, also known as Vytautas the Great from the 15th century onwards, was a ruler of the Grand Duchy of Lithuania, which chiefly encompassed the Lithuanians and Ruthenians. He was also the Prince of Hrodna (1370–1382), Prince of Lutsk (1387–1389), and the postulated king of the Hussites. Švitrigaila was the Grand Duke of Lithuania from 1430 to 1432. He spent most of his life in largely unsuccessful dynastic struggles against his cousins Vytautas and Sigismund Kęstutaitis. 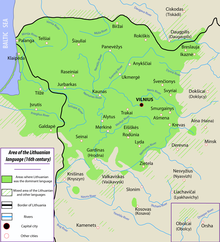 The Lipka Tatars are a group of Tatars who originally settled in the Grand Duchy of Lithuania at the beginning of the 14th century. The first settlers tried to preserve their shamanistic religion and sought asylum amongst the non-Christian Lithuanians. Towards the end of the 14th century, another wave of Tatars – this time, Muslims, were invited into the Grand Duchy by Vytautas the Great. These Tatars first settled in Lithuania proper around Vilnius, Trakai, Hrodna and Kaunas and later spread to other parts of the Grand Duchy that later became part of Polish–Lithuanian Commonwealth. These areas comprise present-day Lithuania, Belarus and Poland. From the very beginning of their settlement in Lithuania they were known as the Lipka Tatars. While maintaining their religion, they united their fate with that of the mainly Christian Polish–Lithuanian Commonwealth. From the Battle of Grunwald onwards the Lipka Tatar light cavalry regiments participated in every significant military campaign of Lithuania and Poland. Kęstutis was a ruler of medieval Lithuania. He was the Duke of Trakai and governed the Grand Duchy of Lithuania, 1342–1382, together with his brother Algirdas, and with his nephew Jogaila. He ruled over the Lithuanians and Ruthenians. In a strict sense, the Union of Krewo or Act of Krėva was a set of prenuptial promises made in the Kreva Castle on 14 August 1385 by Jogaila, Grand Duke of Lithuania, in exchange for marriage to the underage reigning Queen Jadwiga of Poland. The act was very limited in scope and in the historiography the term "Union of Krewo" often refers not only to the particular document but to the events of 1385–1386 as a whole. After the negotiations in 1385, Jogaila converted to Christianity, married Jadwiga, and was crowned King of Poland in 1386. The union was a decisive moment in the histories of Poland and Lithuania; it marked a beginning of the four centuries of shared history between the two nations. By 1569 the Polish–Lithuanian union grew into a new state, the Polish–Lithuanian Commonwealth, and lasted until the Third Partition in 1795. The Pact of Vilnius and Radom was a set of three acts passed in Vilnius, Grand Duchy of Lithuania, and confirmed by the Crown Council in Radom, Kingdom of Poland in 1401. The union amended the earlier act of the Union of Krewo (1385) and confirmed the Ostrów Agreement (1392). Vytautas, Grand Duke of Lithuania, became fully in charge of the Lithuanian affairs, while Władysław II Jagiełło, King of Poland, reserved the rights of an overlord. After the death of Vytautas, Lithuania was to be ruled by Władysław II Jagiełło or his legal heir. The union is generally seen as strengthening of the Polish–Lithuanian union. The Treaty of Melno or Treaty of Lake Melno was a peace treaty ending the Gollub War. It was signed on 27 September 1422, between the Teutonic Knights and an alliance of the Kingdom of Poland and the Grand Duchy of Lithuania at Lake Melno, east of Graudenz (Grudziądz). The treaty resolved territorial disputes between the Knights and Lithuania regarding Samogitia, which had dragged on since 1382, and determined the Prussian–Lithuanian border, which afterwards remained unchanged for about 500 years. A portion of the original border partially survives as the border between the Republic of Lithuania and Kaliningrad Oblast, Russia, making it one of the most stable borders in Europe. 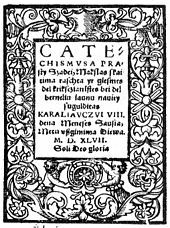 Lithuania proper refers to a region which existed within the Grand Duchy of Lithuania, and where the Lithuanian language was spoken. The primary meaning is identical to the Duchy of Lithuania, a land around which the Grand Duchy of Lithuania evolved. 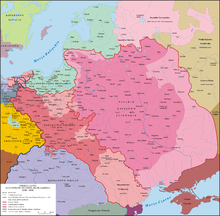 The territory can be traced by Catholic Christian parishes established in pagan Baltic lands of the Grand Duchy of Lithuania subsequent to the Christianization of Lithuania in 1387. They were quite distinguishable, since Ruthenian parts of the Duchy have been already baptised in an orthodox manner. The term in Latin was widely used during the Middle Ages and can be found in numerous historical maps until World War I.
Olshanski was a Lithuanian princely family of Hipocentaur coat of arms from the Grand Duchy of Lithuania. Their patrimony was in Halshany and their property included Rokantiškės and Halshany Castles. During the 14–16th centuries most of the family was Orthodox by faith and Ruthenian by language, although there were exceptions, in particular Paweł Holszański was a Catholic Church official. The Lithuanian Civil War of 1432–1438 was a conflict over the succession to the throne of the Grand Duchy of Lithuania, after Vytautas the Great died in 1430 without leaving an heir. The war was fought on the one side by Švitrigaila, allied with the Teutonic Knights, and on the other by Sigismund Kęstutaitis, backed by the Kingdom of Poland. The war threatened to sever the Union of Krewo, the personal union between Poland and Lithuania. Švitrigaila's alliance with the Grand Master of the Teutonic Order, Paul von Rusdorf, launched the Polish–Teutonic War (1431–1435) but failed to secure victory for Švitrigaila. The Lithuanian Civil War of 1389–92 was the second civil conflict between Jogaila, King of Poland and Grand Duke of Lithuania, and his cousin Vytautas. At issue was control of the Grand Duchy of Lithuania, then the largest state in Europe. Jogaila had been crowned King of Poland in 1386; he installed his brother Skirgaila as ruler of Lithuania. Skirgaila proved unpopular and Vytautas attempted to depose him. 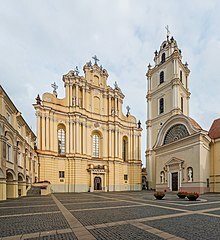 When his first attempt to take the capital city of Vilnius failed, Vytautas forged an alliance with the Teutonic Knights, their common enemy – just as both cousins had done during the Lithuanian Civil War between 1381 and 1384. Vytautas and the Knights unsuccessfully besieged Vilnius in 1390. Over the next two years it became clear that neither side could achieve a quick victory, and Jogaila proposed a compromise: Vytautas would become Grand Duke and Jogaila would remain Superior Duke. This proposal was formalized in the Ostrów Agreement of 1392, and Vytautas turned against the Knights. He went on to reign as Grand Duke of Lithuania for 38 years, and the cousins remained at peace. The Christianization of Lithuania occurred in 1387, initiated by King of Poland and Grand Duke of Lithuania Władysław II Jagiełło and his cousin Vytautas the Great. It signified the official adoption of Christianity by Lithuanians, the last pagan nation in Europe. This event ended one of the most complicated and lengthiest processes of Christianization in European history.